Wow, it has been 10 years that I have my macy's card. This is my first store card. I remember them saying when I first got it that to use it so that I can build my credit. I did use the card but have paid it off but never close the account. Thank you macy's! What's good is there's no minimum purchase required. I like freebie like this. Mister G decided to unfriend me since yesterday. I don't really log on to my adsense account everyday to check it but when I check it tonight it says my account is disabled. Toink! My Bad! Is Eating Tuna Allowed During Pregnancy? When I was pregnant with my daughter, I do not remember my doctor prohibiting me from eating tuna. I know he told me not to eat raw food but not any particular seafood. Tuna being one of our favorites, I am very sure that I have eaten tuna when I was pregnant. One reason why pregnant women are scared to eat tuna is because of its mercury content but the seafood industry contends that by not letting pregnant women eat tuna during pregnancy, they are depriving their children of important nutrients. 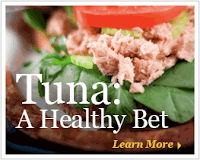 More information about the benefits of eating healthy tuna can be found here. In our household, tuna is a favorite. We have learned to lessen our intake of pork and we focus more on seafood and chicken. I always have tuna salad at home; perfect for my lunch and snack when traveling. I use canned tuna in water mixed it with light mayo, a little mustard, finely chopped onions and lettuce. I usually have tuna salad on a hard roll or wheat bread with some potato chips or eat it with my favorite crackers and iced tea. This is already my lunch when I am working. It is light and healthy. I can eat my favorite tuna everyday with no guilt. We went to a filipino store today to buy some fish and veggies. As soon as we enter the store, my daughter knows where to find her food. One of them is this Yan-Yan. Who wouldn't love yan-yan, right? This one has double cream - chocolate and strawberry. My daughter does not actually finish the whole thing, once the cream is gone, she does not like it anymore. Mommy will finish it. The breadsticks alone are yummy. This is our favorite jasmine rice. We always buy it from Costco but recently we had a chance to visit BJ's and I was surprised that BJ's carry the same kind of rice too for the same price of $13.99 for a 25 lb. bag. This price is cheaper from the jasmine rice being sold by some oriental stores. Just a saving tip from my kitchen to yours. This is a Sponsored Post written by me on behalf of Beads Of Cambay. All opinions are 100% mine. Since I joined a social networking network online, I saw friends, classmates and relatives that I have not communicated with since I graduated from high school. It is nice to be updated with each other’s lives once again although we live thousand miles apart. The internet makes us closer to each other; helping us with our plan to have a reunion in the Philippines sometime next year. Right now, we are helping one of our high school friends whose family was greatly affected by the recent typhoon in the Philippines. They lost everything including their house and cars. So, we are trying to raise some money to help them get back into their feet and start a new life. This family used to have a handicraft and jewelry making business so some of us here, including me have helped her family by sending some materials like beads and gemstones that she can use in jewelry making. Actually she wrote in her webpage that her family did not totally lost everything because they still have their knowledge to start the business again is untouched. Little by little they already started by just making some jewelry at their rented apartment and sell them online. I am still looking for more beads and gemstones for her at Beads Of Cambay. I always check their new arrivals for the latest beads trends. Beads of Cambay is an online beads supplier to both wholesalers and retailers worldwide, carrying best quality gemstone beads, freshwater pearls, sterling silver beads, brass beads and a lot more. For Wholesale Beads & Gemstones, you can save up to 30% of your order plus worry free shopping, excellent customer service and free shipping on all domestic shipments for orders over $100. If you are into jewelry design or business, check out beads of cambay for the latest trends and newest supply of wholesale beads, stones of different colors and shapes plus all their great deals to their customers. Like the famous Ugg boots, Emu boots is also Australian made. It is pronounced as "eem-you" not "eem-moo." An Emu is a tall native bird in Australia - the second largest bird on earth. You can buy a pair of Emu boots for less than $100, cheaper than the Ugg boots. It is very comfortable and warm, a sure hit during winter time. Any word that would mean more than COLD, that's how it feels outside. My computer says 18 degrees but because of the wind gust, it is around 5 degrees outside. It has been like this since yesterday. Nobody in our household dared to go out. Too Cold!! !